Delta started taking delivery of single-aisle Airbus A321s early last year, and it must like them, because it just placed a big order for a bunch of the newest version of that plane. The company said it has come to terms with Airbus to place firm orders for 100 A321neos, with options for another 100 beyond that. Deliveries are due to start in 2020. According to Delta’s website, it now has 26 A321-200s in its fleet. Those planes carry 192 passengers – 20 in first class, 29 in Comfort+ and 143 in economy, or about the same number as the 757s they are replacing. The A321neos will have 197 seats, Delta said, including 20 in first, 30 in Comfort+ and 147 in economy. The A321s will replace “smaller, less technically advanced aircraft,” Delta noted. 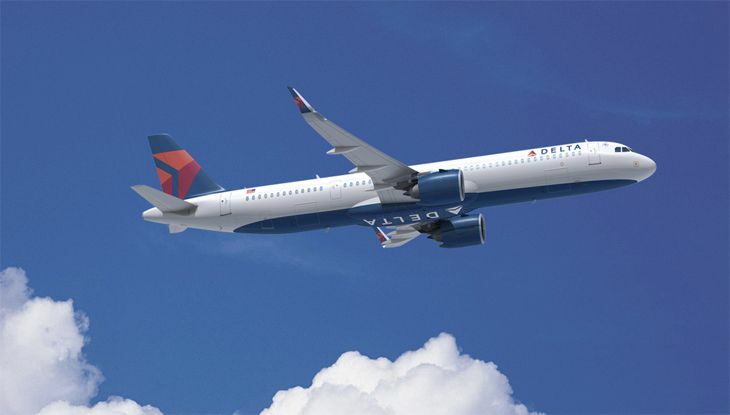 According to FlightGlobal.com, the new jets will replace Delta’s aging A320s, B757s and MD80s. 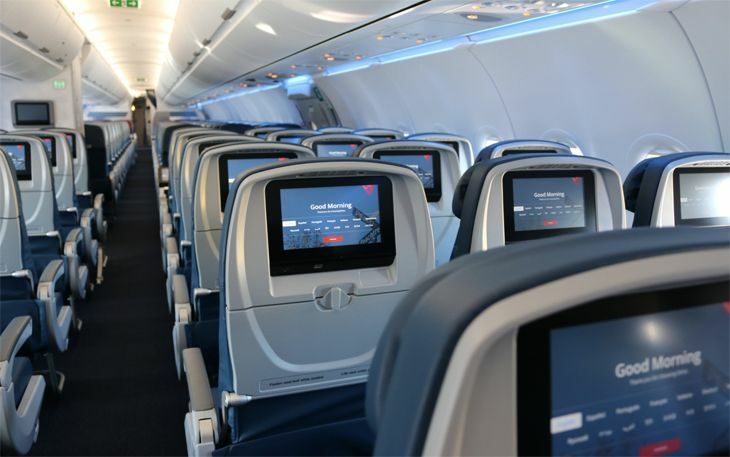 The higher-tech A321neos will feature high-speed, satellite-based Wi-Fi and on-demand entertainment, with power ports and streaming video content available at each seat through Delta Studio, the airline said. Cabins’ overhead bins will be 25 percent larger, and cabin lighting will be full-spectrum LED. Delta reportedly chose the Airbus narrow-bodies over Boeing’s 737MAX-10s. Currently, Delta’s single-aisle fleet includes 148 aircraft from Airbus (A319s, 320s and 321s) and 171 from Boeing’s 737 group (-700s, -800s and -900ERs). 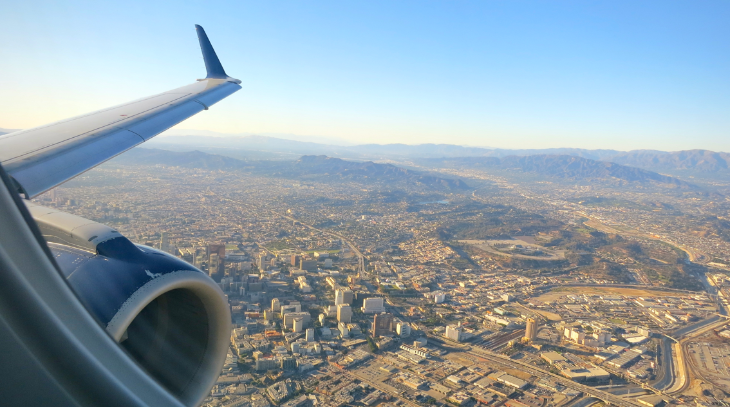 Take a deep dive into a new Delta A321 here. The A321neo (the “neo” stands for “new engine option”) is also popular at other U.S. airlines. For instance, Alaska’s Virgin America unit is currently deploying them on several Hawaii and mainland routes; Hawaiian Airlines is about to start flying them from mainland cities to the islands; and Frontier Airlines recently placed an order for 134 A320neos and A321neos. According to Airbus, the single-aisle planes in its “neo” group are about 20 percent more fuel-efficient than regular A319/20/21s. Airbus said “typical” seating for an A321neo would be 206 in a two-class layout – although the aircraft could have as many as 240 seats. The A321neo has a range of 7,400 km. (about 4,600 miles or 4,000 nautical miles) vs. 5,900 km. 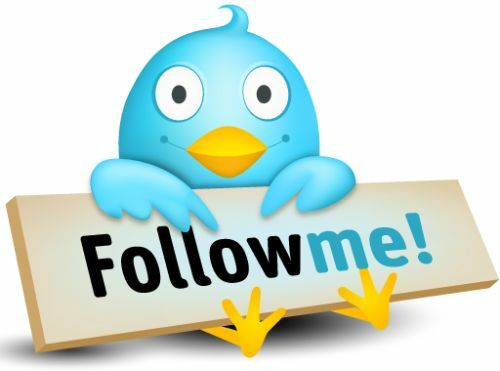 for a regular A321 – or about 25 percent more. Have you flown on an A321 yet? How’d you like it? How does it compare to your favorite Boeing plane? In the latest effort to renew its fleet of smaller jets, Delta has placed a big order for a new aircraft model from Canadian manufacturer Bombardier, turning away from the Brazilian-made Embraers that it has recently favored. The company said it has ordered 75 new Bombardier CS100 jets in order to “cost-effectively reshape and upgauge its narrowbody fleet.” Like other major carriers, Delta keeps turning to larger jets to replace the smaller ones in its fleet. Because it has ordered the CS100s, the company said, “Delta will no longer induct the E190 into its fleet as planned.” Just a few months ago, Delta had said it planned to acquire up to 20 Embraer E190s that would carry just under 100 passengers. Delta said its new CS100s will have a 2×2 first class cabin and 2×3 Delta Comfort and Main Cabin seating, although its announcement didn’t mention how many seats the planes would have. Bombardier’s website says the CS100 is designed to carry 108 passengers in a two-class configuration. Bombardier says the CS100 economy seats are 19 inches wide; that compares with 18.25 inches on Delta’s existing 76-passenger E175s. The manufacturer also said that the the aircraft’s overhead bins can accommodate a carry-on bag for each passenger. Delta noted that the CS100s, which it said will be deployed on short- to medium-haul routes, will provide a 20 percent improvement in fuel efficiency over similar-sized aircraft. It will start taking delivery of the planes in spring of 2018. 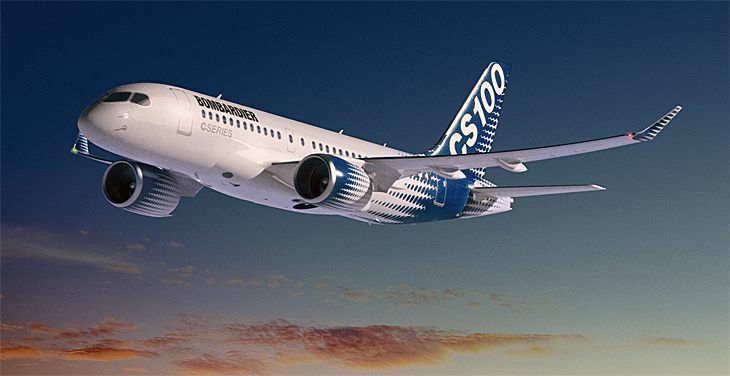 The airline’s order also includes options for 50 more C series Bombardier aircraft, with the possibility of changing some orders into a larger version, the CS300. The airline said that since 2009, it has phased out 280 50-seat regional jets from its fleet. This latest aircraft order will make Delta the launch customer for Bombardier’s new CS100 model. UPDATE: April 29: Today Delta announced that it has ordered 37 more Airbus A321s, and now has 82 of the new birds on the books. Here’s more about Delta’s newest jet.